Pro Duo, data caps, data security, Moore's Law, and lots more! You live a busy life, we get it. Not everyone has the time to follow all the developments in PC hardware and technology week after week. That’s where we come in. As we’ve been doing for the past couple of months now, we highlight interesting news and reviews that you might have missed in the past week, be it because you were away on a business trip or you’ve been spending all your time playing Dark Souls 3. Whatever the reason, we have your back...or backpack. Let’s get started! Comcast has decided to keep its data caps intact, but in lieu of removing them altogether, as the FCC (and broadband subscribers) would prefer, it’s tripling the amount of data allocated to subscribers to 1TB per month, the ISP announced this week. It was a week ago today that Intel announced plans to eliminate up to 12,000 positions globally, or 11 percent of its total workforce, as part of a transformation strategy. Intel CEO Brian Krzanich shared more details about those plans today, which includes continuing to abide by Moore's Law. Well, sort of. As revised in 1975, Moore's Law dictates that the number of transistors in a processor will double around every two years. It's named after Gordon Moore, a co-founder of Intel who originally predicted in 1965 that the number of transistors would double annually. Moore's Law (the revised version) has driven innovation in the semiconductor industry and at Intel in particular for the past 50 years, though every so often, there's chatter that it's no longer feasible. That's been the popular opinion in recent times as Intel struggles to transition its manufacturing process from 14 nanometers to 10 nanometers. Just last month, Intel seemingly signaled the end of its tick-tock release cadence, which was getting ready to be disrupted with Kaby Lake, a second consecutive tock release (the first being Skylake) to buy some time for Intel to work on Cannonlake. It was originally thought the disruption would be a one-time anomaly, but in a recent 10K filing, Intel hinted that the tick-tock era might over. That in turn prompted talk of Moore's Law coming to an end, though don't tell that to Krzanich. 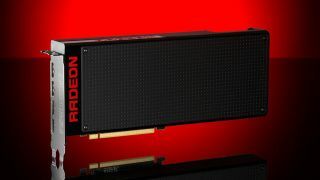 When AMD showed off the new Fiji GPUs last year, they talked about four products: R9 Fury X, (vanilla) R9 Fury, (miniature) R9 Nano, and a dual-GPU card that was eventually christened the Radeon Pro Duo. The first card showed up in June, followed by the Fury in August and the Nano in September. By all rights, the Pro Duo should have launched not long after the Nano, but that never happened, and the longer we waited, the more we wondered what was going on with the dual-GPU halo card. Today is the official launch of AMD's Radeon Pro Duo, but it feels a bit half-hearted. AMD informed us last week that they're not sampling the Radeon Pro Duo to reviewers—or at least, not "traditional" reviewers (meaning, consumer technology websites). We'll get to that in a moment, but all we have to go on right now are product images and a slide deck, the latter of which includes some benchmarks and a spec sheet. So we're not reviewing the Pro Duo as such, but that doesn't mean we don't have plenty to discuss. You see, the Pro Duo is effectively CrossFire R9 Nano, on a single PCB, so armed with a couple of R9 Nano cards we're able to get a pretty clear idea of how the Pro Duo would perform. In college, I spent a year lugging around an eight pound behemoth of a laptop, which I thought had everything I wanted out of a portable computer. I was wrong, and since then I’ve sworn by a desktop at home and an ultraportable laptop for on-the-go: first a puny Netbook, then a lithe Sony Vaio, a MacBook Air, and my current system, a new Dell XPS 13. The XPS 13’s fast NVMe SSD, Skylake CPU and close to 10 hours of battery life make it a fantastic browsing and work machine. Historically, though, Intel’s integrated graphics have been terrible for playing anything but simple 2D PC games and classics 10+ years old. I wondered if that was still the case. The XPS 13 runs Intel’s integrated HD Graphics 520, a 24 execution unit GPU capable of pumping out 403.2 gigaflops. The most common integrated graphics solution on the Steam Hardware Survey, 2012’s HD Graphics 4000, had 16 execution units capable of 332.8 gigaflops. And for reference, my system’s HD Graphics 520 isn’t even close to the most powerful integrated GPU Intel offers—the Iris GPUs can offer double, maybe even quadruple the performance. In other words, I tried my hand at gaming with one of the weaker Intel GPUs available now, with a range of games I wouldn’t normally expect to be able to play on a three pound laptop. The results were better than I expected. Logitech spent plenty of R&D time and money on its Romer-G switch, so it’s no surprise that it installs them only on its top-end boards. If you want the top-end looks without the top-end price tag, Logitech offers the G610 Orion, which features Cherry MX mechanical switches. Logitech migrated the design of its G810 spectrum on to the G610. It’s an easy way to maintain image consistency across the lineup and is much more cost efficient for the manufacturer. Not that we’re complaining; the Logitech G610 is built like a tank. Made from thick industrial-grade plastic, it should easily handle a beating. It doesn’t lose out on aesthetics appeal either. The matching matte finish on the chassis and the keys gives the entire board a streamlined look. Embedded proudly on the top left is Logitech’s logo and yes, it does light up. Senators Feinstein and Burr, we have to talk about encryption. It's not common practice for us to comment on policy here at PC Gamer Hardware (formerly maximumpc.com), though we do cover it in our news feeds. In my home state of California (that Sen. Feinstein represents), encryption has run up against the needs of law enforcement. This conflict over privacy and security has recently become a critically important issue to people across the U.S. and abroad. Senators, you both recently co-sponsored a bill called the Compliance with Court Orders Act of 2016, attacking encryption in a way that would endanger personal privacy, the economy, and national security. I don’t question that you proposed this bill with the best of intentions, but it appears you don’t understand the technology you’re trying to legislate. Senators, this bill will lead to disaster if allowed to come to fruition. This pagoda will not fit actual people inside, but it can turn a couple ones and zeroes into virtual people—virtual people that can wear silly hats and wield giant swords and cover doorways in sticky bombs and emote in professionally voiced Scottish accents. It’s certainly not a powerhou—er, power-pagoda, but there’s enough going on in its guts for the pagoda to work as a good-looking TV-adjacent media machine. MSI forum user dtien87 built the One Pillar Pagoda as part of a seven day modding event, inspired to represent some iconic Vietnamese architecture through case-modding. The end result turned out pretty well, I’d say. Besides the lovely roof structure, what stands out most to me is how the cooling loop flows through a panel on the PC’s base to give the impression of a pond or slow stream beneath. It’s a soothing, hypnotic illusion. There is no universal formula for running every bit of VR content available, but there are recommended requirements for different headsets like the Oculus Rift and HTC Vive. Both require a well equipped PC with a certain level of hardware, and to ensure what you're buying meets or exceeds what's required, Asus has launched its own "Beyond VR Ready" program. You might be tempted to roll your eyes at this point, though Asus says there's an actual "testing and configuration" process associated with the Beyond VR Ready program, one that involves it and "partner engineers cooperating on the optimization of firmware and drivers for superior VR compatibility and performance." Products bearing the Beyond VR Ready logo have been "tested to deliver a reliable and immersive VR experience." Take from that what you will. From our perspective, this appears little more than a marketing maneuver that's more focused on highlighting the company's own products than it does with truly assisting the VR category. It's also not entirely clear what exactly Asus is alluding to by looking beyond VR. To us, that suggests either certifying components that exceed the recommended specs—as in, beyond what's required for an adequate VR experience—or certifying parts that both meet VR requirements and are well equipped for non-VR tasks. It appears neither one is correct, and instead Asus is playing the compatibility angle. IDC counts both traditional slates and detachables like Microsoft’s Surface Pro line as tablets. However, it’s the slate-style tablets that are in freefall mode. Slates account for the vast majority of the entire tablet market, but they just can’t compete with high-end PCs like gaming systems or even general purpose PCs. As a result, tablets are being relegated to the low-end of the market.